England's main obstacle to a place in the World Cup final is a player who is adored by football fans around the world, but is a controversial figure in his native Croatia. For Luka Modric, a year of success on the football field has contrasted dramatically with chaos off the pitch as the Real Madrid star has become mired in a corruption case back at home which traces back to his departure from Dinamo Zagreb for Tottenham back in 2008. Former Zagreb chief executive Zdravko Mamic also worked as an agent and he was found guilty of siphoning off funds from the sale of stars such as Modric and Dejan Lovren. The players' reputations have suffered because of the perception that they tried to protect Mamic in statements they made during the saga; Modric was charged with perjury. Mamic, who has since fled to Bosnia, had strong links with the country's political establishment and his story has become intertwined with public dissatisfaction over economic problems and the supposed greed of the elite. A mural to Modric in Mostar was defaced. In the city of Zadar, where his family lived as war refugees, a banner stating 'Luka, you will remember this one day' was displayed. Perhaps this Russian run has been a release from the stress of his real-life problems. The simple fact is that England will have to put the shackles on the 32-year-old if they are to emerge from Wednesday's showdown. It could be argued that he is currently playing the best football of his career, even if his role as Croatia's main man affords him less freedom than he can enjoy in a Real Madrid side where he is surrounded by stars and often drifts wide to make an impact. On paper there will be a Champions League final rematch in the centre of the park, with Modric to the fore for Croatia and Liverpool's Jordan Henderson holding the fort as the main engine room operator in Gareth Southgate's 3-5-2. It's not necessarily that straightforward, however, as Modric has taken up a range of positions during this tournament. For example, in Croatia's hard-fought success over Russia on Saturday - a second successive shoot-out win - Modric spent only 15pc of his time in the attacking third. In spells, Croatia's attacking passing was slow and laboured and they lacked Modric's game-changing ability to lift the tempo and pick out killer passes. Although it was a high-scoring affair, the hosts effectively concentrated on making themselves difficult to beat. 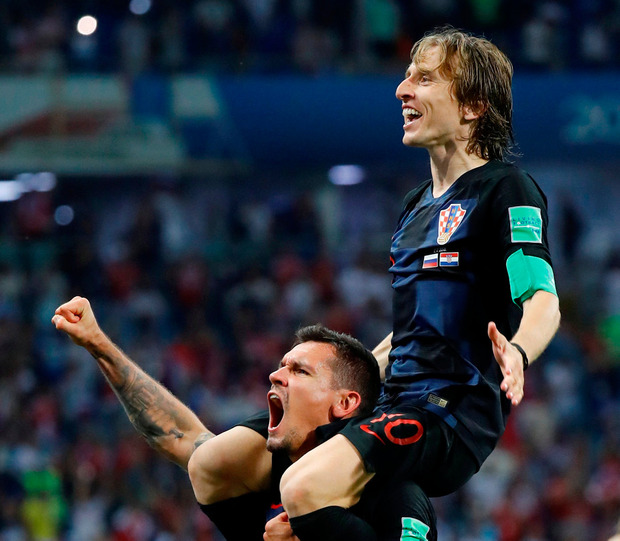 Towards the tail end of a qualifying campaign in which they required a final-day win in Ukraine to make the play-offs, new coach Zlatko Dalic encouraged Modric to play in a more advanced role and it paid off spectacularly. There were patches during the Russia encounter where he was neutralised from his brief, although his quality still stood out every time he got on the ball. The clash with England has the potential to suit his strengths if Southgate sticks with the strategy that has brought his side to this point. Before the round of 16 clash with Colombia, there was a fear they would be exposed if Henderson was left isolated in the centre of the park against the South American playmakers - especially if Dele Alli and Jesse Lingard were pressed on. However, the absence of James Rodriguez changed Jose Pekerman's approach and their negative play ultimately got what it deserved. England were more composed and controlled the ball better. Against a rigid Sweden side that rarely deviated from its 4-4-2, they were also much sharper in that department. With a back three that is encouraged to step out, they have warmed to the role of the technically comfortable side that retains possession. For Southgate's preferred XI, the Croatia match is the first time they will meet a team that is stronger in that area. They may not be as explosive up front, but Dalic has better midfield operators and the key to the Luzhniki encounter will be how England cope with the movement of Modric and Ivan Rakitic. The Barcelona player is a key foil. In the thrashing of Argentina, Rakitic marshalled the defensive midfield area and was instrumental in the stopping of his clubmate Lionel Messi. In the end, both stars ended up on the scoresheet against a ragged opponent. In the early stages of a congested encounter with Denmark, Rakitic was prominent in the opposition box. However, he dropped off later on, with Modric slightly more advanced as he sent through the killer ball which led to the late penalty that he ultimately missed. It's the way that he slips into room and moves the ball on quickly and without fuss that torments opponents. After the Champions League decider, a panel of accomplished midfielders lavished praise on Madrid's low-key hero. Steven Gerrard asked if Modric was the best midfielder in the world; Frank Lampard hailed his calm demeanour and detailed why it was hard to play against him. "Modric plays like he's in the park," he said. "He's never bothered. 'I'll just receive it and move it on' - he's so calm." England's opposition in the knockout stage have failed to really drag Henderson out of his station, which provides protection to the defence; it was only late in the game in Samara on Saturday, when it became slightly more stretched, that Sweden fashioned any opportunities. With Modric and Rakitic rotating as deep-lying playmakers, Henderson will need an energetic and disciplined showing from Alli and Lingard - if Southgate opts to stick with that duo - to avoid a situation where he is outnumbered by a team that can patiently work the ball forward. Alli's wellbeing remains a talking point and England need him at peak fitness to curb the influence of his predecessor at Spurs. Defence has to start from the front. Croatia are far from a two-man team, though, and talented wideman Ivan Perisic has the ability to ghost into threatening positions. Ante Rebic is another versatile winger who showcased his speed against the Danes. England's wing-backs have impressed in this tournament, but they face a completely different type of test if there are spells of the match where they don't have the ball. Granted, these questions were asked before the Colombia match and, even before the unavailability of James was confirmed, the word coming out from those close to the England camp was that Southgate was determined to go for it and play on the front foot. There is a possibility they will overpower Croatia if they do so; they are the set-piece kings after all and went direct against Sweden when necessary in order to force those opportunities. Russia highlighted Croatian vulnerabilities under fire, and England offer much more variety than the departed natives. However, there is a risk attached to trying to really take the game to a side with ball players like Rakitic and the masterful Modric. He may have made poor decisions in his personal life, but once he crosses the white line, the diminutive technician tends to make the right ones and play his way out of trouble. If he is allowed to shine, England - and not football - will be coming home.